Forkhill or Forkill (from Irish: Foirceal) is a small village and civil parish in south County Armagh, Northern Ireland, in the ancient barony of Upper Orior. 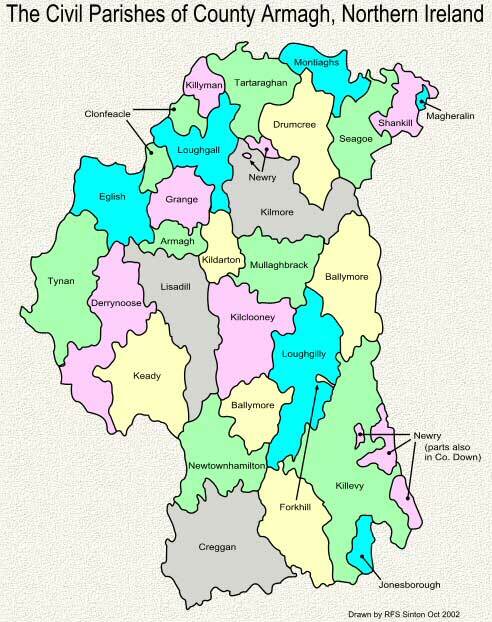 It is within the Ring of Gullion and in the 2011 Census it had a recorded population of 498. It was also one of the most dangerous and unforgiving places on earth for British soldiers and other security force personnel during the 30 year “conflict” and the South Armagh IRA seemed able to slaughtered at will and the areas nickname “Bandit Country” was written in the blood of the innocent. Below is a list of British army & other security personnel whom lost their lives in or around the Forkhill area during the troubles , hero’s one and all. 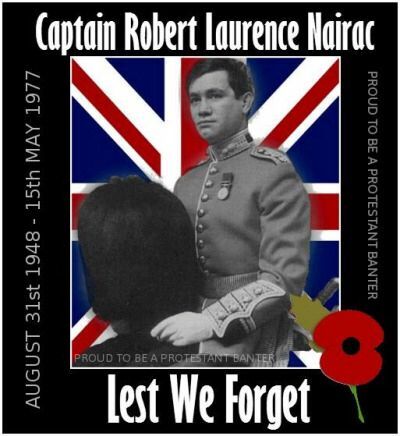 The most famous name on the list is Captain Robert Nairac , whose body has never been recovered and is named as one the Disappeared. I have included civilians and republican deaths at the end of the list. Shot by snipers while on joint British Army (BA) / Royal Ulster Constabulary (RUC) foot patrol, Killeavy, near Forkhill, County Armagh. He died 30 December 1974. Shot by snipers while on joint British Army (BA) / Royal Ulster Constabulary (RUC) foot patrol, Killeavy, near Forkhill, County Armagh. 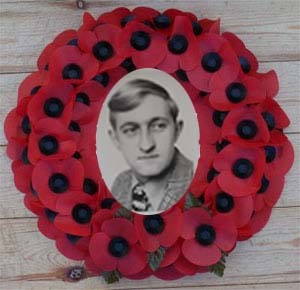 Shot by sniper while on British Army (BA) foot patrol, Bog Road, Forkhill, County Armagh. Injured by booby trap bomb hidden in abandoned car, Dromintee, near Forkhill, County Armagh. Intended for British Army (BA) foot patrol. He died 14 March 1974. Killed by booby trap bomb hidden in abandoned car, Dromintee, near Forkhill, County Armagh. Intended for British Army (BA) foot patrol. Killed by booby trap bomb in field near his home, Forkhill, County Armagh. From Dublin. Died several hours after being found shot in the legs, by the side of New Road, near Forkhill, County Armagh. Shot by undercover British Army (BA) member, shortly after being detained at a friend’s home, Tievecrom, near Forkhill, County Armagh. The South Armagh Brigade of the Provisional Irish Republican Army (IRA) operated during the Troubles in south County Armagh. It was organised into two battalions, one around Jonesborough and another around Crossmaglen. By the 1990s, the South Armagh Brigade was thought to consist of about 40 members, roughly half of them living south of the border. It has allegedly been commanded since the 1970s by Thomas ‘Slab’ Murphy who is also alleged to be a member of the IRA’s Army Council. Compared to other brigades, the South Armagh IRA was seen as an ‘independent republic’ within the republican movement, retaining a battalion organizational structure and not adopting the cell structure the rest of the IRA was forced to adopt after repeated intelligence failures. As well as paramilitary activity, the South Armagh Brigade has also been widely accused of smuggling across the Irish border. Between 1970 and 1997 the brigade was responsible for the deaths of 165 members of British security forces (123 British soldiers and 42 Royal Ulster Constabulary (RUC) officers). A further 75 civilians were killed in the area during the conflict, as well as ten South Armagh Brigade members. The RUC recorded 1,255 bombings and 1,158 shootings around a radius of ten miles from the geographic center of South Armagh in the same period. South Armagh has a long Irish republican tradition. Many men in the area served in the Fourth Northern Division of the Irish Republican Army during the Irish War of Independence (1919–21) and, unlike most of the rest of the Northern Ireland IRA, on the republican side in the Irish Civil War (1922–23). Men from the area also took part in IRA campaigns in the 1940 and 1950s. At the beginning of the Northern Ireland Troubles in August 1969, rioters, led by IRA men, attacked the RUC barracks in Crossmaglen, in retaliation for the attacks on Catholic/nationalist areas in Belfast in the Northern Ireland riots of August 1969. After the split in the IRA in that year, the South Armagh unit sided with the Provisional IRA rather than the Official IRA. The following August, two RUC constables were killed by a bomb in Crossmaglen. A week later, a British soldier was killed in a firefight along the border. However, the IRA campaign in the area did not begin in earnest until 1971. In August of that year, two South Armagh men were shot and one killed by the British Army in Belfast, having been mistaken for gunmen. This caused outrage in the South Armagh area, provided the IRA with many new recruits and created a climate where local people were prepared to tolerate the killing of security force members. During the early 1970s, the brigade was mostly engaged in ambushes of British Army patrols. In one such ambush in August 1972, a Ferret armoured car was destroyed by a 600 lb landmine, killing one soldier. There were also frequent gun attacks on foot patrols. Travelling overland in South Armagh eventually became so dangerous that the British Army began using helicopters to transport troops and supply its bases – a practice that had to be continued until the late 1990s. According to author Toby Harnden, the decision was taken shortly after a Saracen armoured vehicle was destroyed by a culvert bomb near Crossmaglen, on 9 October 1975. Subsequently, the British Army gave up the use of roads to the IRA in South Armagh. IRA volunteer Éamon McGuire, a former Aer Lingus senior engineer, and his team claim that they were responsible for getting the British Army “off the ground and into the air” in South Armagh. He was identified as the IRA’s chief technical officer by the Central Intelligence Agency. Another noted IRA commander at that time was the commanding officer of the first battalion, Captain Michael McVerry. He was eventually killed during an attack on the RUC barracks in Keady in November 1973. Around this time IRA engineers in South Armagh pioneered the use of home-made mortars which were relatively inaccurate but highly destructive. In 1975 and 1976, as sectarian violence increased in Northern Ireland, the South Armagh Republican Action Force, allegedly a cover-name for the South Armagh Brigade, carried out two attacks against Protestants. In September 1975 they attacked an Orange lodge in Newtownhamilton, killing five members of the lodge. Then, in January 1976, after a series of loyalist Ulster Volunteer Force (UVF) attacks on Catholic civilians in the border areas (including the Reavey and O’Dowd killings the previous day), the group shot and killed ten Protestant workmen in the “Kingsmill massacre” near Bessbrook. The workers’ bus was stopped and the one Catholic worker taken aside before the others were killed. In response, the British government stated that it was dispatching the Special Air Service (SAS) to South Armagh, although the SAS had been present in the area for many years. While loyalist attacks on Catholics declined afterwards and many Protestants became more reluctant to help the UVF, the massacre caused considerable controversy in the republican movement. By the end of the 1970s, the IRA in most of Northern Ireland had been restructured into a cell system. South Armagh, however, where the close rural community and family connections of IRA men diminished the risk of infiltration, retained its larger “battalion” structure. On 17 February 1978 the commander of the 2nd Battalion Royal Green Jackets, Lieutenant Colonel Ian Corden-Lloyd, was killed and two other soldiers injured when the Gazelle helicopter he was travelling in was attacked by an IRA unit near Jonesborough. At that moment, a gun battle was taking place on the ground between British soldiers and members of the South Armagh Brigade. The helicopter crashed while taking evasive manoeuvres after being fired at from the east side of Edenappa road. Corden-Lloyd’s subordinates had been accused of brutality against Catholic civilians in Belfast in 1971. In August 1979, a South Armagh unit killed 18 soldiers in the Warrenpoint ambush. This was the biggest single loss of life inflicted on the British Army in its deployment in Northern Ireland (Operation Banner). A number of South Armagh IRA members were imprisoned by the end of the 1970s and took part in the blanket protest and dirty protest in pursuit of political status for IRA prisoners. Raymond McCreesh, a South Armagh man, was among the ten republican hunger strikers who died for this goal in the 1981 hunger strike. The South Armagh Brigade retaliated for the deaths of the hunger strikers by killing five British soldiers with a mine that destroyed their armoured vehicle near Bessbrook. During the mid-1980s, the brigade focused its attacks on the RUC, killing 20 of its members between 1984 and 1986. Nine of these were killed in the February 1985 Newry mortar attack. In 1986, the British Army erected ten hilltop observation posts in South Armagh. These bases acted as information-gathering centres and also allowed the British Army to patrol South Armagh more securely. Between 1971 and the erection of the hilltop sites in the mid-1980s (the first in 1986), 84 members of the security forces were killed in the Crossmaglen and Forkhill areas by the IRA. After this, 24 security force personnel and Lord Justice Gibson and his wife were killed in the same areas, roughly a third of the previous yearly rate. In March 1989, two senior RUC officers were killed in an ambush near Jonesborough. Chief Superintendent Harry Breen and Superintendent Bob Buchanan were returning from a meeting with the Garda Síochána in the Republic of Ireland, where they had been discussing a range of issues including ways of combating IRA attacks on the cross-border rail link, when they were ambushed. This incident was investigated by the Smithwick Tribunal into alleged collusion between the IRA and the Gardaí. As the divisional commander for South Armagh, Breen was the most senior policeman to have been killed during the Troubles. South Armagh became the most heavily militarized area in Northern Ireland. In an area with a population of 23,000, the British Army stationed around 3,000 troops in support of the RUC to contain an unknown number of paramilitaries. In the late 1980s and early 1990s, the IRA elsewhere in Northern Ireland found that nine out of ten planned operations failed to materialize. However, the South Armagh Brigade continued to carry out varied and high-profile attacks in the same period. By 1991, the RUC acknowledged that no mobile patrols had operated in South Armagh without Army support since 1975. On 30 December 1990, Sinn Féin member and IRA volunteer, Fergal Caraher, was killed by Royal Marines near a checkpoint in Cullyhanna. His brother Michael Caraher, who was severely wounded in the shooting, later became the commander of one of the South Armagh sniper squads. These squads were responsible for killing seven soldiers and two RUC members until the Caraher team was finally caught by the Special Air Service in April 1997. The South Armagh Brigade also built the bombs that were used to wreck economic targets in London during the 1990s, specially hitting the financial district. The truck bombs were sent to England by ferry. On 22 April 1993, the South Armagh IRA unit took control of the village of Cullaville near the border with the Republic, for two hours, making good use of dead ground. The fact that the IRA executed the action despite the presence of a British Army watchtower nearby, caused outrage among British and Irish parliamentary circles. The South Armagh Brigade was by far the most effective IRA brigade in shooting down British helicopters during the conflict. They carried out 23 attacks on British Army helicopters during the Troubles, bringing four down on separate occasions: the Gazelle shot down in February 1978 near Jonesborough, a Lynx in June 1988, while in 1994 another Lynx and an RAF Puma were shot down in March and July respectively. The shooting down of the Lynx in 1994 during a mortar attack on Crossmaglen barracks is regarded by Toby Harnden as the most successful IRA operation against a helicopter in the course of the Troubles. A sustained machine gun attack against a helicopter was filmed by a Dublin television crew in March 1991 outside Crossmaglen Health Center. There was no reaction from British security although the RUC/Army base was just 50 yards away. The only successful IRA attack against an Army helicopter outside South Armagh was carried out by the East Tyrone Brigade near Clogher, County Tyrone, on 11 February 1990. By 1994, the safest way for the British army to travel across South Armagh and some areas of Tyrone and Fermanagh was on board troop-carrying Chinook helicopters. The IRA ceasefire of 1994 was a blow to the South Armagh Brigade, in that it allowed the security forces to operate openly in the area without fear of attack and to build intelligence on IRA members. When the IRA resumed its campaign in 1996-97, the South Armagh IRA was less active than previously, although one of the sniper teams killed one soldier and seriously wounded an RUC constable. But the snipers also lost a number of their most skilled members, such as Mícheál Caraher, who were arrested and imprisoned just weeks before the second ceasefire. The capture of the sniper team was the single major success for the security forces in South Armagh in more than a decade, and was arguably among the most important of the Troubles, but by then, the IRA and Sinn Féin had achieved huge political gains towards their long-term goals. The last major action of the brigade before the last IRA ceasefire was a mortar attack on Newtownhamilton RUC/Army barracks, on 12 July 1997. The single Mk-15 mortar bomb landed 40 yards short of the perimeter fence. In 1997, several members of the South Armagh Brigade, based in Jonesborough and Dromintee, following Michael McKevitt, left the Provisional IRA because of its acceptance of the Mitchell Principles of non-violence at a General Army Convention in October of that year and formed a dissident grouping, the Real IRA, which rejected the peace process. Their discontent was deepened by Sinn Féin’s signing of the Good Friday Agreement in 1998. Most of the South Armagh IRA stayed within the Provisional movement, but there were reports of them aiding the dissidents throughout 1998. The Omagh bombing of August 1998, a botched Real IRA operation which killed 29 civilians, was prepared by dissident republicans in South Armagh. Thomas Murphy and the leadership of the IRA in the area have allegedly since re-asserted their control, expelling dissidents from the district under threat of death. Michael McKevitt and his wife Bernadette were evicted from their home near Dundalk. IRA members in South Armagh ceased cooperating with the RIRA after the Omagh bombing. After the Provisional IRA announced its intention to disarm and accept peaceful methods in July 2005, the British government announced a full demilitarisation plan which included the closing of all British Army bases in South Armagh by 2007. The normalisation process, negotiated under the provisions of the Good Friday Agreement in exchange for the complete decommissioning of IRA weaponry, was one of the main goals of the republican political strategy in the region. Since the army wind-down in 2007, security in the area is the sole responsibility of the Police Service of Northern Ireland. Senior IRA figures in South Armagh, notably Thomas Murphy, are alleged to have been involved in large-scale smuggling across the Irish border and money-laundering. Other alleged illegal activities involve fraud through embezzlement of agricultural subsidies and false claims of property loss. In 2006, the British and Irish authorities mounted joint operations to clamp down on smuggling in the area and to seize Thomas Murphy’s assets. On 22 June 1998 a deadly incident involving fuel smuggling took place near Crossmaglen, when former Thomas Murphy employee Patrick Belton ran over and killed a British soldier attempting to stop him while driving his oil tanker through a military checkpoint. Belton was shot and injured by other members of the patrol, but managed to flee to the Republic. He was later acquitted of any charges, but he eventually agreed in 2006 to pay €500,000 for cross-border smuggling. Some sources claim that the smuggling activities not only made the South Armagh brigade self-sustained, but also provided financial support to most of the IRA operations around Northern Ireland. The IRA control over the roads across the border in South Armagh enabled them to impose ‘taxes’ on every cross-border illegal enterprise. The South Armagh Sniper is the generic name given to the members of the Provisional Irish Republican Army‘s (IRA) South Armagh Brigade who conducted a sniping campaign against British security forces from 1990 to 1997. The campaign is notable for the snipers’ use of .50 BMG calibre Barrett M82 and M90 long-range rifles in some of the shootings. One of the first leaders of the Provisional IRA, Seán Mac Stíofáin, supported the use of snipers in his book Memories of a Revolutionary, attracted by the motto “one shot, one kill”. The majority of soldiers shot dead in 1972 (the bloodiest year of the conflict in Northern Ireland) fell victim to IRA snipers. About 180 British soldiers, Royal Ulster Constabulary (RUC) officers and Her Majesty’s Prison Service prison staff members were killed in this way from 1971 to 1991. What’s special about the Barrett is the huge kinetic energy… The bullet can just walk through a flak jacket. South Armagh was the prime place to use such weapon because of the availability of Brits. They came to dread it and that was part of its effectiveness. Contrary to the first British Army assessment and the speculation of the press, there was not just a single sniper involved. According to Harnden, there were two different teams, one responsible for the east part of South Armagh, around Dromintee, the other for the west, in the area surrounding Cullyhanna. The volunteer in charge of the Cullyhanna unit was Frank “One Shot” McCabe, a senior IRA member from Crossmaglen. Each team comprised at least four members, not counting those in charge of support activities, such as scouting for targets and driving vehicles. Military officials claim that the Dromintee-based squad deployed up to 20 volunteers in some of the sniping missions. The teams made good use of dead ground to conceal themselves from British observation posts. Another six rounds achieved nothing, albeit two of them near-missed the patrol boat HMS Cygnet, in Carlingford Lough and another holed Borucki sangar, a British Army outpost in Crossmaglen square. On 31 July 1993 at 10:00 pm a British Army patrol which had set a mobile checkpoint on Newry Road, near Newtownhamilton, was fired at by an IRA sniper team. The British soldiers returned fire, but there were no injuries on either side. The marksman usually fired from a distance of less than 300 metres, despite the 1 km effective range of the rifles. Sixteen operations were carried out from the rear of a vehicle, with the sniper protected by an armour plate in case the patrols returned fire. At least in one incident, after the killing of a soldier in Forkhill on 17 March 1993, the British Army fired back at the sniper’s vehicle without effect. The IRA vehicles were escorted by scout cars, to alert about the presence of security checkpoints ahead. A third unrelated sniper attack, which resulted in the death of a British soldier, was carried out by the IRA at New Lodge, North Belfast, on 3 August 1992. Two other soldiers were wounded by snipers at New Lodge in November 1993 and January 1994. Two people were arrested and a loaded rifle recovered in the aftermath of the latter incident. On 30 December 1993 Guardsman Daniel Blinco became the last soldier killed by snipers in South Armagh before the first IRA ceasefire in 1994. His killing, along with the reaction of the MP of his constituency, was covered by the BBC´s Inside Ulster, which also showed Blinco’s abandoned helmet and the hole made by the sniper’s bullet on the wall of a pub. The tabloid press of that time started calling the sniper ‘Goldfinger’ or ‘Terminator’, the nicknames current in Crossmaglen’s bars. The last serviceman killed by snipers at South Armagh, Lance Bombardier Stephen Restorick, was also the last British soldier to die by hostile fire during the Troubles, on 12 February 1997. Restorick’s killing resulted in a public outcry; Gerry Adams called his death “tragic” and wrote a letter of condolence to his mother. McGinn provided the RUC with a lot of information about IRA activities, and even betrayed Frank McCabe, the IRA commander behind the sniper campaign, but he eventually withdrew his statement. One of the key players in the British campaign against the South Armagh sniper was Welsh Guards‘ Captain Rupert Thorneloe, according to journalist Toby Harnden. Thorneloe worked as an intelligence liaison officer between the 3rd Infantry Brigade and the RUC Special Branch. Thorneloe, who reached the rank of Lieutenant-Colonel, was killed in July 2009 by an improvised explosive device during the war in Afghanistan. Another senior figure involved in the British efforts against the sniper squads was SAS Staff Sergeant Gaz Hunter, whose experience in South Armagh dated back to 1975. Despite the sense of relief among British forces after the arrests, there was concern over the other two Barrett rifles still in possession of the South Armagh Brigade. One of the IRA volunteers captured, Michael Caraher, was the brother of Fergal Caraher, a Sinn Féin member and IRA volunteer killed by Royal Marines at a checkpoint on 30 December 1990 near Cullyhanna. Michael, also shot and wounded in the same attack, had lost a lung in the aftermath. Despite some witnesses claiming that the shooting was unprovoked, the Marines involved were acquitted by Lord Chief Justice Hutton. The shooting of Guardsman Daniel Blinco in Crossmaglen took place on the second anniversary of the killing of Fergal Caraher. Michael Caraher was thought to be the shooter in several attacks, but he was only indicted for the case of the maimed constable. He was defended by solicitor Rosemary Nelson, later killed by the loyalist organisation Red Hand Defenders. The other three men of the sniper team were convicted in 1999 for six killings, two of them unrelated to the sniping operations (the deaths of two men when one of the team’s members, James McArdle, planted the bomb at Canary Wharf in 1996). Sniper at work! – love it! Haha! Great days!